The fourth annual Forward Festival Startup Showcase is almost here! The Startup Showcase features an evening of startup pitches from 5 of Madison’s most compelling emerging companies, as well as update pitches from 20 companies that presented in prior years. The Startup Showcase is a high energy stage that celebrates and showcases what’s next (and what is going on now) in Madison’s startup ecosystem. 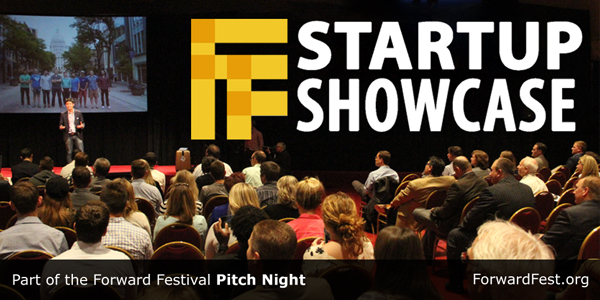 The Startup Showcase will kick off at 4 pm on Tuesday, August 23rd at the Monona Terrace, and is part of Pitch Night. Pitch Night includes the Startup Showcase (4pm), neXXpo (5pm), and Pressure Chamber (7pm) plus complimentary appetizers and beverages! Pitch Night is included with Forward Technology Conference registrations and the Forward Pass. You can also purchase Pitch Night only tickets for $30 here. The Rabble – The Rabble started with a simple idea: libraries deserve software that reflects their values. MUSICat is a fully open sourced platform designed by The Rabble with libraries to empower them to share local music and support creative communities. Export Abroad – Export Abroad is a global intelligence software and emerging markets advisory company. The core mission is to break down the barriers of international expansion and provide companies with the tools to be successful in any market. EnsoData – EnsoData is creating machine intelligent software to unlock the vast wealth of clinical expertise lying dormant in archived data. Their first product automates sleep data analysis for sleep clinics. Understory – Understory detects rain, hail, wind and other weather events directly at the earth’s surface, where the risk to life and property is greatest. The ground-truth-based detection is a marked enhancement in both resolution and fidelity, providing real time datasets and graphical views of the movement and intensity of weather events, which leads to better insight and early detection of risks. The BikeMobile – The BikeMobile is a fully stocked mobile bicycle repair van that provides on-site service to individuals at home, or in a group setting, in Madison, WI. The Forward Festival Startup Showcase is presented by Capital Entrepreneurs and Accelerate Madison. Previous PostPrevious 2016 Forward Festival Returns August 18-25!